Sand wedges are an essential tool to help you score significantly lower on your golf game. The majority of a game of golf is decided around the greens, and having a quality sand wedge will help improve your accuracy and hit. When you are inside the 100 yards, you want to get the golf ball as close to the pin as you can. Having an above-average short game is important, and the five best sand wedges guide can help you to buy best wedge to achieve that. The problem is that it is difficult to find a quality sand wedge in an overcrowded market, and you never know which companies you can trust. Before you purchase a sand wedge, it is important to keep in mind things like durability and control. In this guide, you will find the five best sand wedges on the market today, and tips on what to look for when buying a sand wedge. The best sand wedges are the ones that combine both quality and durability. Most top brand golf wedges are always up to industry standards in terms of performance and the latest technology. Depending on your golfing level, going with a lesser quality wedge may be okay since you are going to be putting it through a lot of wear and tear as you practice. Your sand wedge is meant to improve your golfing game performance. To so you need to make sure that your wedge has great versatility and control. These two things are what separate average wedges from great ones. Versatility is important when thinking about golf wedges because your sand wedge should be able to perform in a variety of different scenarios. The loft of a wedge is the angle that is created between the face of the wedge and an imaginary vertical line. An increased loft on a wedge means more elevation for your shot and a higher ball flight with less distance. It is all a complicated matter of physics, but trust us you are going to want a sand wedge with good loft. The average loft of a sand wedge is between 54 and 58 degrees. The bounce of a sand wedge refers to the area of the club that hits the ground and makes the club “bounce” through the surface under the ball at impact. The word bounce also refers to the elements that are included in sole design: sole width, the bounce angle, leading edge, rocker and a camber of a wedge. You are going to want a sand wedge with a good bounce to ensure your game is the best it can be. The sole grind of a wedge is the shaping of the sole of the wedge near its heel or toe. Wedge manufacturers are offer a wide range of sole grinds aside from the traditional wedge sole. The name comes from the method they use to shape the sole, which is grinding it down with a machine until is suitable for certain turf conditions and shots. When searching for the best sand wedge, you should consider the type of turf and shots you’re going to be taking to ensure that it has the most effective sole grind for your game. After a wedge has been constructed, a finish is put on it to give it an individual look and color. While the finish has nothing directly to do with performance or your game, it is all a matter of personal preference. You should know that different finishes last longer than others. This Callaway sand wedge was designed by the legendary Phil Mickelson, who collaborated with Callaway wedge maker Roger Cleveland to come up with this high-quality wedge design. So what, beyond having a famous name on it, makes this particular wedge so special? Well, the answer is that the design is a combination of two different wedges. It also has a grinded out high toe shape and highly durable materials. To top it all off Phil Mickelson himself tested this wedge out on tour until he perfected the look and performance to exactly what he thought it should be. This wedge also has great versatility that lets you take any shot from any angle. It has more surface area and grooves that go up the face. If you want to step up your golf game and hit like a pro, this Callaway sand wedge is the wedge for you. 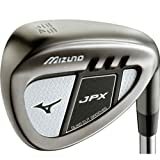 The Mizuno Golf Wedge is a high quality and high performing wedge constructed out of durable steel. Mizuno’s wedges are some of the most aggressive and loved wedges in the market, and the JPX S2 series is no exception. 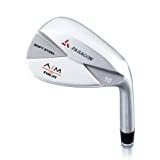 It comes equipped with quad cut grooves with four dimensions, loft specific grooves, smooth cambered sole for more effective bounce, a CNC milled face for added friction and maximum spin, and a black finish to reduce glare from loft face. This is a serious wedge for serious golfers looking to step up their game. It is also a great option for more casual players who want to practice and show off to their friends. Either way, the Mizuno is a great option for all types of golfers. Titleist Vokey’s Wedge is a great option for amateur golfer’s and those who love the game. It comes in a variety of lofts to meet your golfing needs, and is constructed with high quality gold steel ensuring it will last a long time. This wedge is also available in multiple sole grinds for most any golf swing type or turf condition. There is a good amount of trajectory and distance control with this wedge thanks to its precisely milled grooves and machined face texture. These grooves are also responsible for channeling away grass or sand for nice contact between the golf ball and the wedge’s edge. If you are looking for a great wedge to practice with and improve your game, the Titleist Vokey is the wedge for you. The AiM Golf Wedge Club by Paragon gives you tour grade play ability without the tour price. It is a name brand wedge constructed with quality materials like molded soft stainless steel. This Paragon has a superior trajectory and stopping power that every golfer looks for in a good wedge. The style is classic and clean, giving you a sleek look out on the range. But do not let its simplicity fool you, because this wedge is precision built for performance and durability. It is only available in right-handed style, and comes in a variety of lofts for an individualized golfing experience. To get your ball as close to the hole as possible, use the Paragon AiM stainless steel sand wedge. 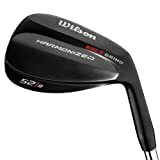 The Wilson Staff Men’s Harmonized Black Chrome Golf Wedge is one of the sleekest and highest performing wedges on this list. It comes equipped with a new innovative sole design in the Harmonized Wedges that now allows players more options around the green. The Wilson wedge is also constructed with an open club face design to improve performance, and a durable anti-glare finish to keep your game at its best. With this sand wedge’s sleek look and high performance abilities, your game will be on par with the pros. A good sand wedge can easily make or break your golf game. Having a quality sand wedge is important for improving your accuracy and overall score. Out of all the five sand wedges we have reviewed in this guide, the one that comes out on top is the Callaway Mac Daddy PM Grind for its versatility, accuracy and quality. This is an excellent sand wedge for amateurs and pros alike with its professional grade quality and amazing loft. When looking for the perfect sand wedge to improve your game, it is important to take into consideration things like durability, loft, bounce, materials, and finish. No matter what level of golfer you are, there is a perfect sand wedge out there for you!